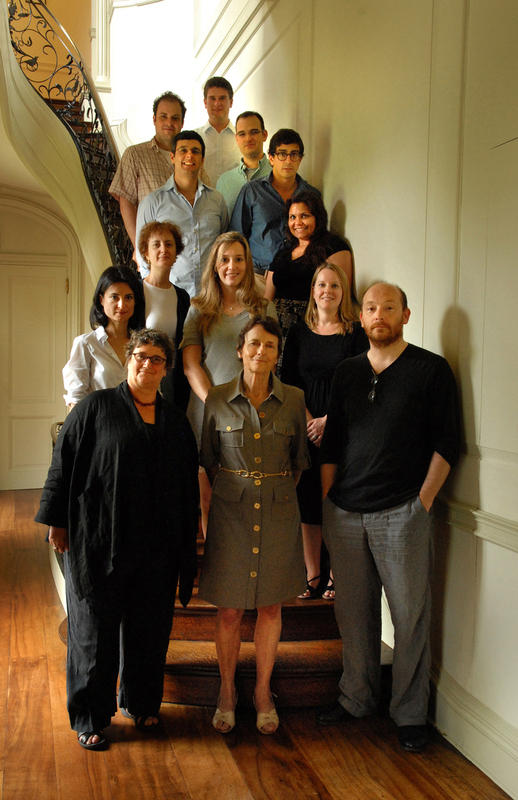 In July 2011, the summer program in Byzantine numismatics and sigillography met once again at the Dumbarton Oaks Center for Byzantine, Pre-Columbian, and Garden and Landscape Studies in Washington, D.C. The program brought together students from the United States, Europe, and Turkey for daily seminars in analytical methods and application of material evidence to archaeological and historical disciplines. In addition to these classes, the final week comprised a series of student presentations on research topics chosen at the outset of the program. The daily seminars were directed by Cecile Morrisson for coins and Eric McGeer and Vivien Prigent (CNRS, Paris) for seals. Students were able to take advantage of the thousands of objects in the Dumbarton Oaks Collection to learn methods of identification, reading, and dating, as well as for discussions about the evolution of iconography and the mechanics and techniques of production. Complementing this collection, an assembly of staff and fellows provided presentations of their own research as well as general expertise both in and out of the seminar. Luca Zavagno (Eastern Mediterranean University) presented a reassessment of the traditional periodization on the island of Cyprus based upon coin finds. Dr. Eurydice Georganteli (Birmingham University/Barber Institute) provided valuable and appreciated insights in the discussions, especially regarding the relationship of coins to archaeology. Jonathan Shea (Dumbarton Oaks) assisted with seminars, managed the collection of lead seals, and presented on the use of several complementary technologies, including the database for Byzantine seals (SIGIDOC). In addition, Joel Kalvesmaki (Dumbarton Oaks), provided an introduction to Unicode fonts, and especially the development Dumbarton Oaks font for coin and seal inscriptions, Athena-Ruby. Meanwhile, Joe Mills, also of Dumbarton Oaks, demonstrated the methods of high-quality digital photography and image manipulation. In the unfortunate absence, for medical reasons, of Sebastian Heath, who had agreed to conduct sessions on map construction, Kuba Kabala introduced the other participants to mapping using Arc-Gis and to the Digital Atlas of the Roman and Medieval Civilizations (Harvard) and Jonathan Shea to the Pleiades gazetteer developed by the Institute for Study of the Ancient World (New York). Student presentations, either as a part of broader research interests or as a contribution to a specific project, rounded out the program in the final week. Sencan Altinoluk (Canakkale University) presented a preliminary catalogue of Byzantine coins and seals in the collection of the Ödemiş Museum in lzmir, Turkey. Esra Erdogan (Marmara University), meanwhile, assembled the seals of the doux of Antioch during the Xlth century, providing a prosopography of the institution during its first hundred years. Dimitrios Krikelikos (Aristotle University, Thessaloniki) studied the excavation coin finds from the Late Roman site ofthe St. Hilarion sanctuary in Gaza. Kuba Kabala (Harvard University) presented a preliminary survey of numismatic data from Balkan excavations and hoards to assess economic, political, and strategic boundaries on the Bulgarian-Byzantine frontier of the IX-Xth centuries. Lain Wilson (Princeton University) provided a technical and stylistic study of the Xlll1h-century gold hyperpyra of JohnIll Vatatzes in the Dumbarton Oaks and Princeton collections. Naomi Pitamber (UCLA) discussed the emergence of the Christ Chalkites imagery on the coins and seals of the Nicaean Empire. Margherita Pomero (University of Bologna) analyzed the emergence of idiosyncratic iconographies during the Xlll1h and XIVth centuries, including the "winged emperor type" and their role in imperial propaganda. Finally, Federico Montinaro (Ecole pratique des hautes etudes, Paris) studied the seals of kommerkiarioi of the VIlth and Vlllth centuries, arguing for a reinterpretation of their function and presenting the patterns of numerical and geographical proliferation down to 730 CE.